Seahawks cornerback Richard Sherman is fifth in the NFL with four interceptions. Richard Sherman isn’t typically one to make excuses, but the Seahawks cornerback believes some officiating calls helped the 49ers in their 19-17 win Sunday. 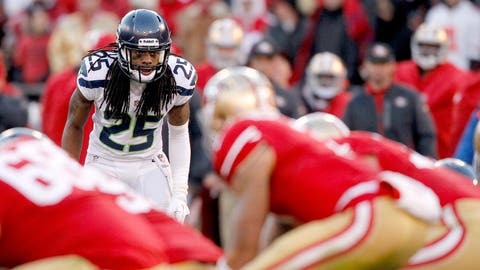 Sherman was called twice for holding on third downs, which led to points for San Francisco. The outgoing cornerback noted that 49ers wide receiver Michael Crabtree, who was making just his second start of the season since returning from a torn Achilles, didn’t have much of an impact on the outcome of the game. "It didn’t make a difference," Sherman said. "It didn’t make a difference at all." Instead, Sherman was adamant it was all about the calls the officials made. "The penalties," Sherman said. "That is what made the difference today."